This issue starts off with a bang if there ever was one. We see Eugene with his crew at their factory making weapons when the foolishness of one of the workers gets him killed and walkers flooding the factory! Eugene and company get outside in the nick of time, but also in time to find Negan and some of his men waiting for them. Well, that ended pretty quickly. Back at Rick's house, he finally wakes up from passing out at the end of last issue. 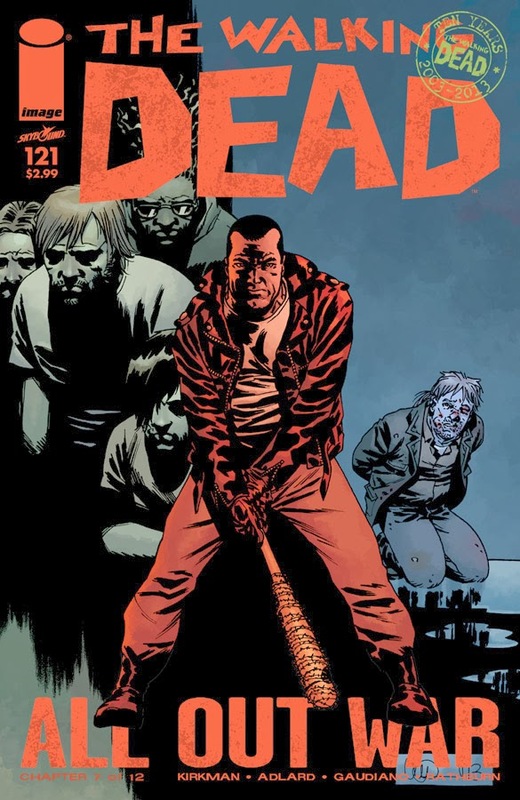 Things have died down since they attack on the town by Negan, but the fight isn't over. Denise, a good friend was bitten and is slowly dying with her boyfriend, Heath at her bedside. The town gets together and Rick decides it is finally time to leave this good town and move on. He's chosen the Hilltop, where Maggie is leader. She says there's plenty of room for all of Rick's people. Hey, he's even leaving behind that doofy phone he would use to talk to Lori's ghost. Or, well, what he thought was her ghost, since he was crazy. That's debatable, anyway, good for Rick! Finally moving on and leaving that part of him behind...with his arm. Too soon? Shoot over to Negan's joint and we have him standing over Eugene, he knows that Eugene was making bullets for Rick, and all Negan wants is the same. He wants Eugene to make his group bullets, and Eugene isn't about that life. He's not willing to bid to Negan's will. So Negan responds to this the best way he knows how, a little bit of threatening and walking off, leaving the prisoner with their thoughts and their thoughts alone. Then the issue closes out, with Eugene letting Negan know that Rick is building toward something big and he's going to win this war. That's about all that happened in this issue, it was the definition of filler. Absolutely nothing important happened in this book after the third page. But it is moving the story along, things are changing, things are moving. There's only 5 issues left in this massive All Out War story. 5 issues left to blow my mind and make me think differently on this book for years and years to come. At least that's what I'm hoping it does. If it doesn't, I guess there's always the show to hope for...right? Until next week readers!